The Carillon Tower, AKA Shafer Tower, on the campus at Ball State University, Muncie, Indiana. The 48 bells are programmed by a computer to chime every 15 minutes from 7AM to 7PM. 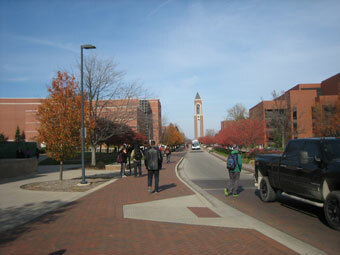 Dedicated in 2002, the tower is now an unofficial landmark of Ball State U. Below are the Hand Records from various events. The records are in PDF (Portable Document Format) form so they may be downloaded simply by clicking on the Hand Record line and opening in Adobe Reader. If you do not have the current Adobe Reader on your computer, go here for a free download. ©2012-2019 . Muncie Duplicate Bridge Club . Munice, IN 47302 . All Rights Reserved.